Charlotte Johnson and Aniela Jurecka drugged horses and ponies and sold them as suitable for children from farms in Staplehurst and Marden, in Kent. The pair recommended vet David Smith, 66, to buyers, who would then give the animals a clean bill of health. All three are due to be sentenced at Maidstone Crown Court on 11 July. Jurecka, 28, of Prospect Place, Collier Street, in Tonbridge, Johnson, 28, of Tollgate Way, Sandling, and Smith, of The Street, Finglesham, Deal, were found guilty of conspiracy to commit fraud by false representation following a 14-week trial. They were arrested following a large-scale operation involving officers from Kent Police, Trading Standards and The Royal College of Veterinary Surgeons. Kent Police said Jurecka and Johnson advertised horses for sale in equestrian publications under the business names of SE Horses and Mid Kent Horses. Text messages downloaded by detectives showed the pair were drugging horses to cover up poor behaviour and lameness. In many cases the paperwork for the horses was altered, with prices for them ranging from £1,950 to £5,700. Throughout the course of the investigation officers identified 17 victims of fraud, whose horses had become uncontrollable once the sedatives had worn off. In once instance, a woman was left unable to walk for a year after being thrown from her horse. Kent Police said it later transpired the animal had serious back problems which made it unsuitable for the activities that Smith had passed it for. Det Con Tracey Brightman said: 'These horses were obtained cheaply by Johnson and Jurecka because they had physical problems or aggressive tendencies. "We believe their issues were masked with drugs supplied by Smith when a potential buyer came to try out the horse. "The dealers made huge profits on unfit, ill and injured horses working with a veterinary surgeon to ensure their lies were covered with credibility." 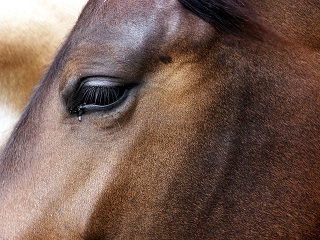 She added that in some cases the horses were so ill they had to be euthanised.